We are Ottawa's ONLY 3D Glow-in-the-dark entertainment facility. A Putt Above's concept started 3 years ago (2007) when owner Shaun St. Louis decided that Ottawa's Westend needed some quality family entertainment that provided activity and excitement year round regardless of the weather. We wanted an inclusive facility that could cater to a broad spectrum of the population from 5 year old children to 85 year old grand-parents as well as the mobility challenged. A glow-in-the-dark mini putt facility was decided upon as it combined an all-weather facility with a universal attraction that ties in well with the promotion of an active lifestyle. To add even more excitement to A Putt Above an additional venue was added called "Balladium". 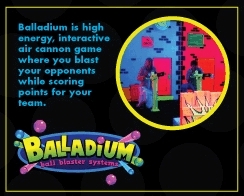 The Balladium is a high energy adrenaline fueled game where opposing teams fire their sponge balls at targets on the wall for points and bragging rights. It has already proven itself popular with all ages and after five minutes in the Balladium our guests always leave invigorated and out of breath from the physical aspect of the game, something unexpected but very addictive. All venues are in black light and the mini putt facility features 3D artwork when viewed through the special glasses. Participants are encouraged to wear white as this makes them "glow". A Putt Above has three themed party rooms for both corporate events and private parties. We are a family run business, not a franchise, who enjoy seeing people have a good time whether for birthday parties, those on dates, or groups coming together to share a good time. We promote a safe and active time for everyone and have ensured our facility meets the expectations of the mobility challenged as well. Located at 3825 Richmond Road in Bells Corners is Ottawa's ONLY 3D Glow in the dark Family Entertainment facility. Our facility is not only 3D but it is in a blacklight environment so make sure to wear white! Time to get out and enjoy Ottawa's ONLY 3D Glow in the dark family entertainment centre. Live and Work in our great city? Need somewhere for the whole family to enjoy themselves? Having a fundraiser and want to add "FUN" to the event? Take in the excitement of our 3D Glow In the Dark miniputt. Take aim at your opponent(s) or targets in our 10 air cannon Balladium to out score your opponents. Our friendly staff tries to ensure you have FUN, use your IMAGINATION, and engage in adrenaline driven ACTIVITY! PARTY LIKE NEVER BEFORE IN 3D BLACKLIGHT! Everyone should experience the SHEER DELIGHT Ottawa's ONLY 3D GLOW-IN-THE-DARK facility. The vibrant colors, the realistic props, the engaging course, feel like your underwater, or crawling through the jungle, or treasure hunting with pirates and ALL in 3D! We take care of all the stress that comes with organizing a party or event. Our friendly staff will work hard to ensure you don't have too. We truly are Ottawa's ONLY destination for true fun and excitement for any Party or Event you want to GLOW on! ADD EXCITEMENT TO YOUR FUNDRAISING EVENT LIKE NEVER BEFORE! Fundraising is suppose to be FUN! Let us help you add that FUN into your next fundraising event with our 3D Blacklight MiniPutt/Mini-Golf and 10 air cannon Balladium/Ball Blaster. Our friendly and courteous staff will work hard so you don't have to! Our facilities are open for extended hours to ensure you maximize your fundraising potential! TEAM OUTTING HAS NEVER BEEN THIS FUN! Our 10 air cannon Balladium/Ball Blaster will allow you to get the adrenaline pumping with the music as you aim at your co-workers or the many targets available. Highest score claims bragging rights and a coupon for your next visit so take aim! Let the vibrant colors, props, and facades take you on an adventure underwater, through the jungle, and treasure hunting with pirates....oh yeah and don't forget to wear white so the many 3D animals can find you.